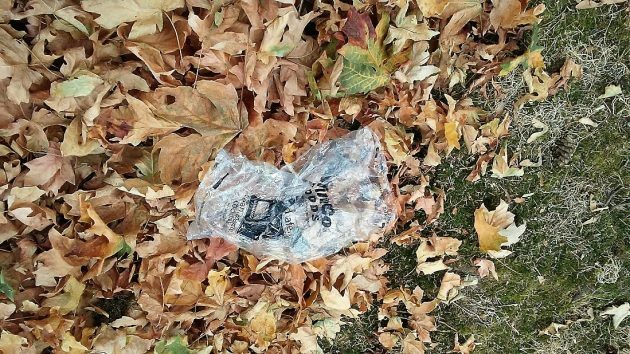 Finding this bit of litter in a pile of leaves in our yard today prompted me to consider, once again, plastic bags and whether they should be banned. My answer: No, they shouldn’t because they are useful, but we all should be more careful when we put them in the trash. One of the reasons that five Oregon cities have banned the use of plastic grocery carry-out bags is that too much of the plastic ends up littering our streams, beaches and ocean. On a website, Portland points out that these flimsy things often blow out of the back of garbage trucks. I’m pretty sure that’s how this bit of debris ended up among the leaves because I know I didn’t bring it home. This kind of bag, by the way, is not affected by the bans in effect in Portland, Eugene, Corvallis and Ashland. It’s not a carry-out bag but used to contain items, usually produce, inside the store. Manzanita, population 725, south of Cannon Beach, has just joined the other four cities. Its ban takes effect Nov. 5. Efforts to impose a statewide ban so far have failed. But even though they could, some companies no longer give you a plastic sack to take your purchases home. That’s a problem for me when I’m on my bike and stop by a store, like those on the coast and in Southern Oregon operated by the company that runs Ray’s. I need a bag with openings that I can slip over the handlebars. I can see the problem with litter, though. All of us can see it, especially along urban streams. On Albany’s Periwinkle Creek, for example, I’ve seen the brush festooned with shreds of torn plastic film after the springtime water has gone down. Early fall at your sprawl? Lots of leaves down to collect that plastic in your image. how to stop their littering! As for your little problem, you can still buy plastic bags. Some scented too. You are older than me by a bit, Hasso. If I can recall a life before plastic bags and plastic bottles, surely you must as well. We survived just fine. Plastics are a convenience. But unlike paper, they do not decompose. They make delivering products cheaper as well, compared to glass or metals, but again at a pretty significant environmental cost. It’s not the litter on the curbs of Albany which are the issue, but the eventual pollution downstream and into the ocean. There is not enough demand to reuse all the plastics and other packaging which may be recycled. Just the other day, I was wondering why we don’t see paper drives like we had back in the 70’s. You know, folks would have stacks and stacks of newspapers in their garage, bundled up with twine. Then a few times a year the school would collect them to raise money for some purpose. Well, I googled, this, wondering if I should propose to our school that we consider this as a fundraiser. It seems that the answer is not that technology has reduced the numbers of newspapers. If anything, that would slow down the collection but not eliminate it. But the salvage cost, what one can get for a ton of newspapers, has dropped through the floor. This article from 1991 states that at that time the boy scouts were dealing with salvage value of $48/ton, where it used to be $180/ton. As long as it is cheaper to package with new material, and disregard the environmental cost, people and companies will do so. We can put in a few feel good solutions, such as banning plastic grocery bags. But look at what is in that paper bag, or that cloth bag that you use, and it will be filled with plastic packaging of all sorts. So these types of bans really don’t address the environmental problem. Bring your own. Those bags can’t be trusted anyway. I’m far from an environmentalist, but the amount of plastic like this going into our ocean simply cannot continue for the sake of convenience. How much of the ultimate environmental damage caused by litter was/is caused by the banned carry-out bags? If someone could convince me that the ban was really helping, I would grudingly concede and accept the considerable difficulty of living without those bags available at the check-out. Let me explain. Like Hasso, I transport groceries on bike handlebars. Unlike Hasso, I live in Corvallis, don’t own a motor vehicle, don’t really need one, and fear that if I bought one, I’ll get fat and rot (physically, mentally, and morally) from inactivity (search “mismatch disease”) as well as blow all credibility on environmental consciousness. Paper bags are great for stashing in the imaginary trunk of my imaginary car, and very little else. The banned bags are uniquely suited to carrying on handlebars or while walking or riding a bus, all of which I do. Double them for a heavy load. Quadruple them when using old, torn, dirty, worn-out bags saved from long ago (I have hundreds of them). Glass jars always go in the backpack when bike riding, whatever type of bags. Yes, there is a big environmental problem with litter and maybe plastics are worse than some other materials. But, until I’m convinced that THIS PARTICULAR BAN is doing something useful, I consider it greenwashing by corporate interests and militancy by eco-frauds. The idea that we can rid ourselves of problems by banning the object of the problem rather than the subject who causes it is at the root of many conflicts: guns, offensive speech, even war. Until we can change people’s attitudes and actions the problems will remain. Banning plastic bags is not an example of throwing the baby out with the bathwater, it’s keeping the bathwater and throwing out the baby. I’d hate to see a ban and have to start BUYING plastic trash bags. You can use them for multiple things with just a bit of imagination.